Assistant Engineer (Civil Engineering) - 1 Post - 28000 pm - BE / BTech / Diploma in Civil Engineering. 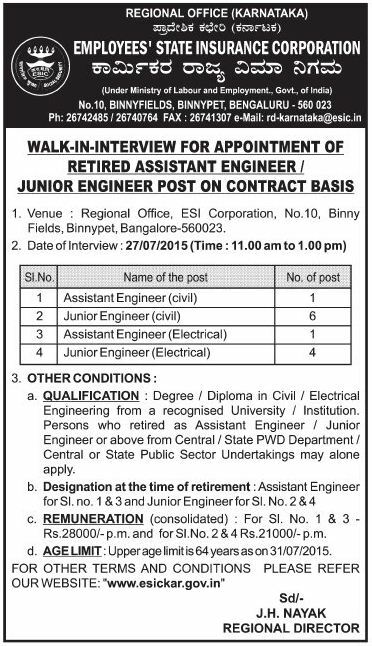 Junior Engineer (Civil Engineering) - 6 Posts - 21000 pm - BE / BTech / Diploma in Civil Engineering. Assistant Engineer (Electrical Engineering) - 1 Post - 28000 pm - BE / BTech / Diploma in Electrical Engineering. Junior Engineer (Electrical Engineering) - 4 Posts - 21000 pm - BE / BTech / Diploma in Electrical Engineering.